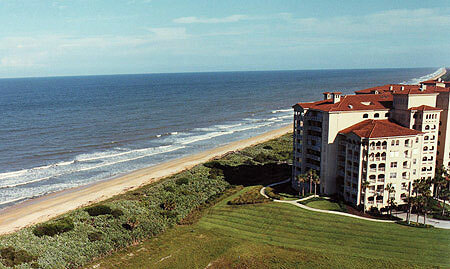 Hammock Dunes condominiums in Palm Coast, Florida. Hammock Dunes is a 997-acre exclusive golf and oceanfront luxury condominium community located along Palm Coast featuring two championship courses, each with its own spectacular clubhouse. 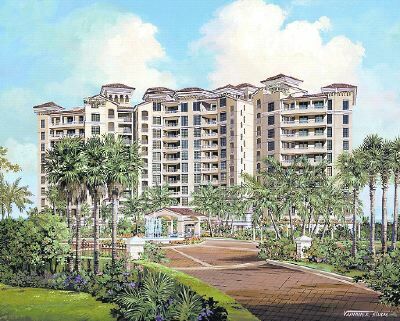 The community features several luxury condominiums including Portofino, Savona, Cambria, Tuscany, Casa Bella and the recently released Le Jardin. 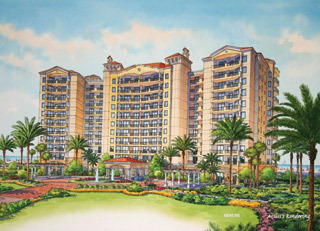 Hammock Dunes is a pristine oceanfront jewel presenting the ultimate country club lifestyle. Framed by blue Atlantic waters, Hammock Dunes offers fabulous amenities, amazing ocean views, a scenic 18-hole Tom Fazio-designed golf course and the newly-completed 18-hole Rees Jones-designed championship Creek course. Punctuated by a 32,000-square-foot, oceanfront clubhouse features a wine room, a social room with bar and serving pantry, a billiard room with wet bar and humidor, and a private theater room equipped with a 100-inch Electrimask viewing screen. Enjoy beachfront living at its finest at Hammock Dunes. Recreational activities are abundant and include watersports, fishing, beachcombing, tennis, and planned social events. Just a short drive from Palm Coast to Jacksonville and Ponte Vedra Beach, you will find over 30 challenging golf courses; beautiful parks; the Cummer Art Gallery; the Florida Theater; the Performing Arts Center, home of the Jacksonville Symphony Orchestra; EverBank Stadium, home of the Jacksonville Jaguars and many other cultural and recreational outlets. This luxurious oceanfront condominium offers 59 spacious residences ranging from 2,228 to 5,255 square feet of living space. Greet your mornings breathing in the ocean air. Usher in your evenings and watch night fall over ocean waves. Living is going to be easy at Casa Bella, where you�re just a moment away from the beach. Le Jardin will offer 26 residences of penthouse proportions, each featuring spectacular ocean/golf course views, spacious floor plans with gas fireplaces and expansive balconies. Tuscany features 64 oceanfront residences, including 6 luxurious penthouses with rich appointments, exquisite details, elegant lobby, reception area, theater, and guest suites. Don't miss your opportunity to live in the paradise you've always dreamed of, call today for your personal tour of Hammock Dunes at (904) 307-8998.